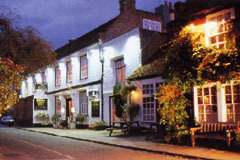 Situated in Shepperton’s historic Church Square and with beautiful landscaped gardens leading down to the Thames, The Warren Lodge Hotel has built its reputation on providing comfortable accommodation, friendly and efficient service and excellent food. The Warren Lodge is ideal for all occasions – the Garden Room, with its adjoining conservatory, opens out onto lawns leading to the Thames and is a delightful setting for your function. The Coach House Restaurant, with its rich panelled interior, is a welcoming place to dine and sample our Head Chef’s inspired selection of exquisite English and Continental cuisine. Parts of the hotel date back some three hundred years and local rumour has it that Lord Nelson and Lady Hamilton enjoyed weekend trysts at a fishing lodge, on the site of the current hotel, at the beginning of the nineteenth century. The Mulberry tree, taking pride of place in the landscaped gardens of the hotel, is even older. Cardinal Wolsey is said to have planted a number of mulberry trees along the river between Hampton Court Palace and Windsor Castle. Our tree is one of very few remaining and still fruits profusely every year. Mulberries from the tree feature on the Warren Lodge's dessert menu, in season. Parties, dinners, barbecues, buffets - the Warren Lodge Hotel offers flexible facilities to suit all occasions. From the traditional lounge, with warming fires in the winter, to the rich panelled interior of the Coach House Restaurant, comfortable well appointed bedrooms, some with river views and others overlooking Church Square, the Warren Lodge Hotel can provide for all your needs. Restaurant open for dinner every evening 7.30-9.15pm and Sunday lunch 12.30-2.30pm. All major credit cards accepted. No service charge. From June to September, why not try lunch on the Riverside Terrace? Wonderful menu - choose from Light Bites through to full three course meals. Whatever your reason for visiting The Warren Lodge Hotel you can be certain of excellent food and wine, complemented by attentive service.